Silver medalist Chris Mazdzer sold his most prized possession for the good of his sport. In October, Chris Mazdzer sold his car, a good car, a sporty 2004 Subaru WRX with more than 145,000 miles but still humming. Mazdzer loved that car. As a professional luge racer, Mazdzer is constantly traveling. He likes to mention that since 2015 he has been in the same location for more than two consecutive weeks just three times. But whenever he returned home, to his room at the Olympic Training Center in Lake Placid or to his family’s place nearby or to Salt Lake City, where he’s living now with his girlfriend, the car would be waiting, like an old friend. But the Suby also began to represent something more: the financial burden of competing in a professional sport that pays even successful athletes just enough to keep them poor and unsuccessful ones less than that. So Mazdzer, 29, unloaded the car for $5,000, an excellent price. He and his girlfriend, Mara Marian, 33, who owns a wedding and event planning business in Salt Lake City, live in a far more densely populated area than the Adirondacks, and Mazdzer figured he would ride his bike some of the time and Uber at others. He would save on insurance and repairs. Cars do not last forever. Nor do lugers. Don’t despair. There’s a happy ending. As Mazdzer spoke, the Olympic silver medal in men’s singles luge lay on the couch beside him. He won the medal on the night of Feb. 11 in South Korea, the first singles luge medal won by a U.S. man in history. 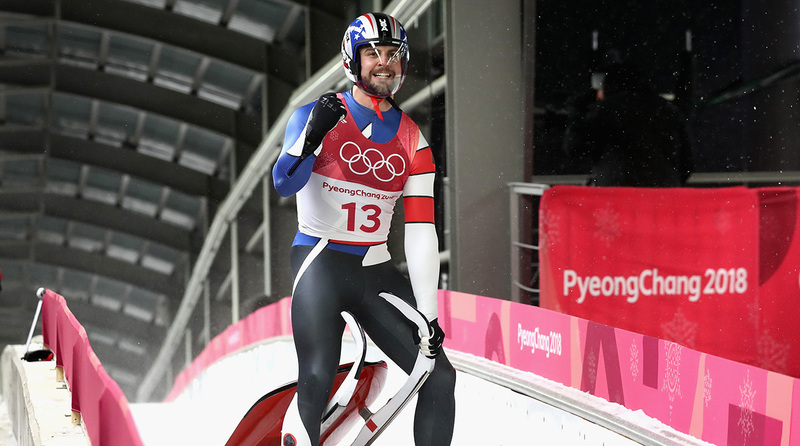 The wind blew like a lion that night, and the windchill dipped to –40° and Mazdzer was sliding in a thin, skintight speedsuit. But when it was over, he leaped from his sled and ran to the stands to celebrate with his family, including twin younger sisters Kate and Sara, who once resented him for missing so many Thanksgivings while chasing his ridiculous goal. But on this night there they were in red, white and blue sports bras in support of their brother. The point: It can be said that there are two kinds of Olympians. There are those for whom the Olympic Games are a springboard to, or an extension of, fame and fortune. At these Games, U.S. snowboarders Chloe Kim and Shaun White and Alpine skiers Mikaela Shiffrin and Lindsey Vonn would fit this description. But there are vastly more Olympians for whom there is no promise of celebrity or riches in the pursuit of medals. They compete for the love of their sports, and that love is tested almost daily. And they are the soul of the Games. Consider Chris Mazdzer. The son of Edward Mazdzer, a neurologist, and Marty Lawthers, the office manager at Edward’s practice, Chris was born in Pittsfield, Mass., and moved to Peru, N.Y., 33 miles south of the Canadian border on Lake Champlain, when he was four. At age eight he was introduced to luge in a junior program. “I loved sledding,” he says, “and luge was ultimate sledding.” At 13, he was traveling to junior competitions in Europe. That same year his family moved to Saranac Lake, just 17 miles from the luge run at Mount Van Hoevenberg in Lake Placid. (The move was for his dad’s career and only coincidentally left Chris closer to the sliding track, but it was welcome for a budding luger.) Chris went to high school at the National Sports Academy in Lake Placid. Between 2003 and ’10, when Mazdzer was a junior slider, U.S. Luge paid up to $20,000 per year for his training and travel. Mazdzer became a senior athlete in 2010 and finished 13th at the Vancouver Olympics. For the next five years he competed on the World Cup circuit from November into March and for the rest of the year lived at the Olympic Training Center in Lake Placid. He would train during the day and at night work as a bartender at the Whiteface Lodge. He also worked at weddings and other parties in Lake Placid during the summer. “I worked as much overtime as I could, and it was pretty lucrative,” said Mazdzer. By lucrative, he means working 50 to 60 hours a week, in addition to training, to earn $16,000 in his best year. Now he has resolved to continue his career for another four years. Two luge medalists in Sochi, Russia’s Albert Demchenko and Italy’s Armin Zöggeler, were over 40. Mazdzer would like to mentor young sliders and prepare for a career as a financial planner. (He has a degree from DeVry University, earned online, in a program coordinated through the USOC.) And the USOC will pay him $22,500 for winning a silver medal. With that money, Mazdzer says, he plans to buy a new car.